Reliance Jio Infocomm, which own pan India BWA spectrum is going to invest in making submarine cable system along with several international carriers. Reliance Jio formed a consortium with Telekom Malaysia Berhad (TM) (Malaysia), Vodafone Group (UK), Omantel (Oman), Etisalat (UAE) and Dialog Axiata (Sri Lanka) to establish the Bay of Bengal Gateway (BBG) submarine cable system. All the carriers signed the Construction and Maintenance Agreement (C&MA) and the Supply Contract for BBG in Kuala Lumpur today (April 30, 2013) as it is announced. 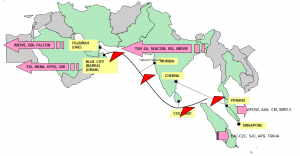 The BBG submarine cable system, spanning approximately 8,000 km, will link Malaysia (through Penang) and Singapore to the Middle East (Oman and United Arab Emirates) with connections reaching out to India (Mumbai and Chennai) and Sri Lanka. The construction of BBG is planned not only to provide connectivity between South East Asia, South Asia and the Middle East, but also to Europe, Africa and to the Far East Asia through interconnections with other existing and newly built cable systems landing in India, the Middle East and the Far East Asia. BBG will also serve as an extraordinary opportunity for business growth as it will help supporting current and future high capacity requirements from the surrounding areas of the region as well as next generation Internet applications. The official statement from RIL reads, The construction of this cable system is a clear indication of the growing demand for bandwidth at the participating countries. The markets are expected to see strong growth with the continuous efforts in embracing the broadband technologies and infrastructure expansion. The BBG cable system is designed to provide upgradable and transmission facilities by adopting the state-of-the-art 100Gbps technology. This cable system is expected to carry commercial traffic by end of 2014. While Reliance Jio has already made deals with Reliance Communications for optic fiber access in the country and with Bharti Airtel for international bandwidth via later’s i2i submarine cable, the company is looking for a bigger pie in the international bandwidth being a part of the upcoming BBG submarine system. Edit and Republish right/proper indian map within 1hr, its a notice (m a law graduate). You and RIM (if they are also using same map) are forcing me to take a legal action. Will Reliance Jio GigaFiber Shake up the DTH Industry Similar to How it Did for 4G Network?